Today in the US, more and more people are identifying as lesbian, gay, bisexual, or transgender (LGBT). According to a recent Gallup poll, nationwide, 4.1% of Americans identified as LGBT in 2016 (about 10 million people), up from 3.5% in 2012. However, due to perceived and/or actual discrimination in healthcare settings, many of these people often leave healthcare issues unaddressed through fear of being judged or treated differently by the practitioners they encounter. These fears are not unwarranted. Recent studies published in the American Journal of Public Health have shown that there is both implicit and explicit bias among heterosexual healthcare providers against LGBT patients across the country. Fear of discrimination is hugely detrimental to proper healthcare, and exists as a major barrier between LGBT patients and the healthcare environment, affecting people even with illnesses or conditions that have little or no connection to their lifestyle. But the MetroHealth System in Cleveland, Ohio, wants to change this – and has been on a mission to do so for the past ten years. Back in 2007, MetroHealth decided to change the way they serve their LGBT patients by opening Cleveland’s very first dedicated LGBT clinic – The Pride Clinic. Designed to be run alongside non-LGBT patients, the Pride Clinic’s ethos is very much about integration rather than segregation. Ahead of its opening, MetroHealth surveyed LGBT people throughout the area to identify their specific needs and the challenges they faced accessing traditional healthcare. The LGBT community also chose the name for the clinic. Dr Henry Ng, the progenitor of the program, says that the Pride Clinic’s growth and achievements have been remarkable over the years – expanding from a single clinic session on a Wednesday evening to a fully-fledged department on multiple sites serving thousands of patients every year. Speaking about his motivations for the endeavor, Ng says, “There is, I think, a very important piece in having both clinical competency and a cultural competency. […] I think the bottom line is: It's important to have this type of care at all health systems so patients don't fall through the cracks." Now, instead of LGBT patients having to essentially pick a name out of a hat when it comes to healthcare provision, not knowing if they were going to end up with a doctor or nurse that would be sensitive to – or even tolerant of – their lifestyle, they can visit a bespoke service with trained professionals, well-versed in the issues they face. "One of the things we wanted to do was provide certain guarantees to patients who come to see us that the staff would be educated on language that would be culturally competent," said Dr James Hekman, medical director of the Lakewood Family Health Center, where one of the newer branches of the Pride Clinic opened last June. As such, healthcare professionals at Pride Clinics are now given extensive soft skills training, including making sure the questions they ask are sensitive and respectful during medical enquiries, and how to avoid making assumptions. The Pride Clinic is continuing to evolve and grow in the way it delivers care to LGBT patients. One of the most recent developments is now, when you visit a MetroHealth system location, you will notice the staff all wearing a special lapel button. 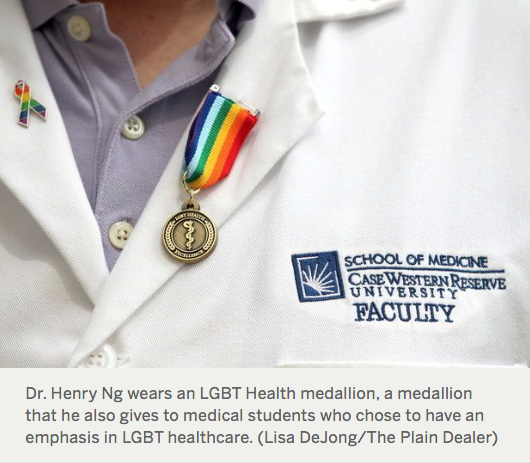 Not a name badge, or a LGBT health medallion (pictured above), but a pin that displays the wearer’s preferred pronoun. Nurses, doctors, and administrative staff will all wear the button showing which gender they identify as – she/hers, he/his, ze/zir, they/their etc. Designed to inspire conversations about gender identity, patients will also be offered stickers displaying their own preferred pronoun. What’s more, as MetroHealth continues to commit to remaining fluid and adaptable to the shifting needs of the LGBT patients they serve, the Pride Clinic is developing brand new youth programs, investing more money into the transgender surgical options they offer, and considering expanding its LGBT center model to one of its locations in Florida. By embracing the social changes which have swept across the globe over the last few decades, and identifying the differences in the healthcare requirements of various groups of people, MetroHealth have worked with the LGBT community to develop a service which is friendly, understanding and accepting to patients from all walks of life. The last word goes to Todd Mahaffey of Warren, a MetroHealth patient who identifies as a gay man. “The gender identification is key because everybody wants to be known as somebody. I think that's a huge plus for our community to know that you can go somewhere where it's comfortable." Hear Sara Laskey, VP and Chief Patient Experience Officerat The MetroHealth System, at Next Generation Patient Experience 2017 this November. Download the Next Generation Patient Experience Agenda to learn more.